You are already to Lesson 2: Energy Supply and Demand. These energy supply and demand lessons will explore more about energy resources. Basically, you will be able to appreciate global and national consumption patterns. 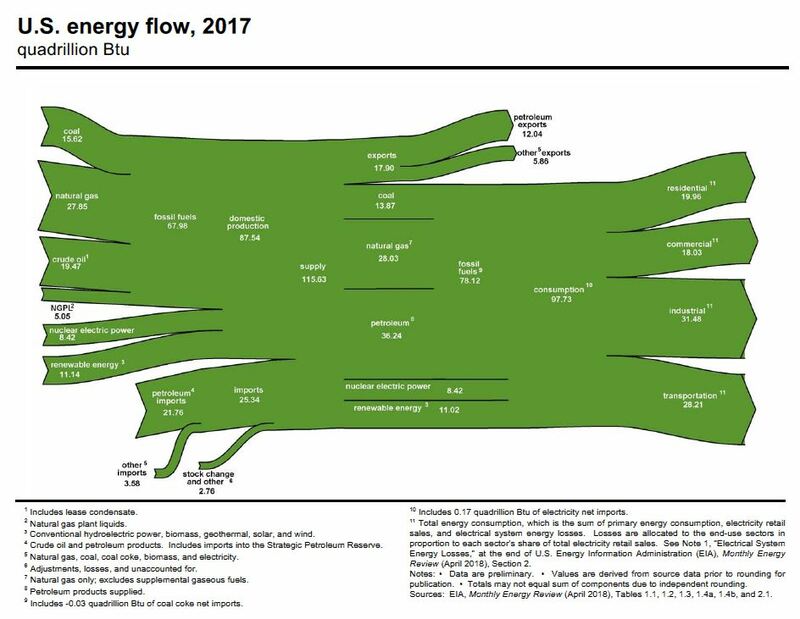 We will go over what kinds of energy we have been consuming, how much we have been consuming, and how we compare with the rest of the world, etc over the past few decades. Based on those patterns we can also deduce some information about how much energy we use to do a job; energy intensity. What kind of energy sources we will be needing, and how much we will be needing based on the past trends? We will also look at energy reserves. Do we have those? Will we need more coal, more oil, or more gas? Do we have enough of those resources? If we have it, great, if not, what do we do? We will be doing those kinds of energy analysis. So obviously you are going to see a lot of numbers and statistics. One of the questions that I always get is: Hey, do I have to remember all these numbers? In 2015, coal and natural gas accounted for 33% of the generation of electricity in this country, nuclear accounted for another 20%, where as renewables accounted for 11% of the electricity generated by Utility companies. Do we have to remember these numbers? My advice is you don’t have to remember everything but you need to get the main message behind these numbers. In other words, you have to know the fact that coal and natural gas are the main energy sources for electricity generation. Similarly, over 75% of our oil products or petroleum products are used for transportation. So we need to know that transportation is basically run by petroleum; petroleum is mostly used for transportation. That is the message. You don’t need to remember the exact numbers. But if there is something that has very insignificant or significant quantities you should note that. For example, renewable energy sources supply about 10% or our energy source (although the exact number is about 11%). That is the message. You don’t need to worry about whether it is 9.2 or 9.5 or 8.5 or 11.2%. So just to give you a clue, you don’t have to worry about the exact numbers but the message that is conveyed using these numbers is what you have to concentrate on. And we will also have one numerical type of problem in this lesson. That problem will be predicting the energy needed for the future. The problem follows an exponential function and we will talk about that and there will be a few numerical problems for you to practice. You can also do the StudyMate questions that are provided to help further your understanding. The StudyMate questions will not be graded. I mean- it will be graded- but it won’t count for your class grade. Ok? Then you will be ready to take the quiz which does count toward your grade. 6 Take Lesson 2 - Quiz (graded); The quiz is available in Canvas. The world energy requirements are projected by several energy companies such as British Petroleum and Exxon Mobil and international agencies like International Energy Agency (IEA) and US Energy Information Administration (EIA). The United States Department of Energy projects strong growth for worldwide energy demand over the 28-year projection period from 2012 to 2040. Although these projections or forecasts are based on the same principles, they differ slightly. Detailed projections of each organization can be seen through the following external links. The total world energy consumption is likely to increase from 549 quadrillion Btus in 2012 to 815 quadrillion Btus in 2040, an increase of 48%. The fastest growth is projected for the nations outside the Organization for Economic Cooperation and Development (OECD), particularly China and India, where robust economic growth accompanies the increase in energy consumption over the forecast period. Almost half of the World's energy Demand growth will be in this region. Gross domestic product (GDP) in developing Asia is expected to expand at an average annual rate of 5.3 percent, compared with 2.1 percent per year for the world as a whole. The world's GDP (expressed in purchasing power parity  terms) rises by 3.3%/year from 2012 to 2040. The fastest rates of growth are projected for the emerging, non-OECD countries, where combined GDP increases by 4.2%/year. In OECD countries, GDP grows at a much slower rate of 2.0%/year over the projection period. Asia is heavily populated and continues to grow at a rapid pace. As a result, industrial growth has also increased, requiring a need for more energy. The World’s energy supply sources for the year 1973 and 2013 are shown in the Figures 2.3 and 2.3a below. Over the past four decades oil has been the world's foremost source of primary energy consumption, and it is expected to remain in that position throughout the projected time frame. Liquids (primarily oil and other petroleum products) are expected to continue to provide the largest share of world's energy consumption over the projected period. In the transportation sector, in particular, liquid fuels continue to provide most of the energy consumed. Although advances in nonliquids-based transportation technologies are anticipated, they are not enough to offset the rising demand for transportation services worldwide. As a result, oil is projected to retain its predominance in the global energy mix and meet 30% of the total primary energy consumption in 2040. Worldwide natural gas consumption is projected to increase from 120 trillion cubic feet (Tcf) in 2012 to 203 Tcf in 2040. By energy source, natural gas accounts for the largest increase in world primary energy consumption. Abundant natural gas resources from shale resources and robust production contribute to the strong competitive position of natural gas among other resources. Natural gas remains a key fuel in the electric power sector and in the industrial sector. It is seen as the desired option for electric power, given its relative efficiency and environmental advantages in comparison with other fossil energy sources. Natural gas burns more cleanly than either coal or oil, making it a more attractive choice for countries seeking to reduce greenhouse gas emissions. Coal is the world’s slowest-growing energy source, rising by an average 0.6%/year, from 153 quadrillion Btu in 2012 to 180 quadrillion Btu in 2040. Throughout the projection, the top three coal-consuming countries are China, the United States, and India, which together account for more than 70% of world coal use. Coal use will continue to increase in developing countries, but in developed or industrialized countries, it will not increase but may slightly decrease. Global coal production is projected to increase from 9 billion short tons in 2012 to 10 billion short tons in 2040. Most of the projected growth in world coal production occurs in India, China, and Australia. Coal remains a vital fuel for world’s electricity markets and is expected to continue to dominate energy markets in developing Asia. According to International Energy outlook 2016, the strongest growth in electricity generation is projected to occur among the developing, non-OECD nations. Increases in non-OECD electricity generation average 2.5%/year from 2012 to 2040, as rising living standards increase demand for home appliances and electronic devices, as well as for commercial services, including hospitals, schools, office buildings, and shopping malls. In the OECD nations, where infrastructures are more mature and population growth is relatively slow or declining, electric power generation increases by an average of 1.2%/year from 2012 to 2040. Worldwide, electricity generation from nuclear power is projected to increase from 2.6 trillion kilowatthours in 2015 to 4.5 trillion kilowatthours in 2040. According to International Energy Outlook (2016) projections by US Department of Energy (US DOE), there is still considerable uncertainty about the future of nuclear power, and a number of issues could slow the development of new nuclear power plants. Issues related to plant safety, radioactive waste disposal, and proliferation of nuclear materials continue to raise public concerns in many countries and may hinder plans for new installations. Although the long-term implications of the disaster at Japan's Fukushima Daiichi nuclear power plant for world nuclear power development are unknown, Germany, Switzerland, and Italy have already announced plans to phase out or cancel all their existing and future reactors. In contrast, developing Asia is poised for a robust expansion of nuclear generation. Most of the increase is by China's addition of 139 gigawatts (GW) of nuclear capacity from 2012 to 2040. In a nuclear plant, heat is produced by nuclear fission (splitting of an atom's nucleus into many new atoms) inside uranium fuel. As a result of fission, heat energy is released and the steam spins a turbine generator to produce electricity. Moderate growth in the world’s consumption of hydroelectricity and other renewable energy resources is projected over the next 25 years, averaging 1.9 percent per year. Much of the projected growth in renewable generation is expected to result from the completion of large hydroelectric facilities in developing countries, particularly in developing Asia. China, India, and other developing Asian countries are constructing or planning new, large-scale hydroelectric facilities. Among the industrialized nations, only Canada has plans to construct any sizable hydroelectric projects over the forecast period. Much of the expected increment in renewable energy consumption in the industrialized world is projected to be non-hydropower renewable energy sources, including particularly wind energy in Western Europe and the U. S. In addition, biomass and geothermal energy sources are expected to grow rapidly in the U. S.
In hydroelectricity, mechanical energy from the water being pulled downward by gravity is converted to electrical energy. More specifically, a hydroelectric generator directs the flow of water through a turbine, which extracts the kinetic energy from the movement of the water and turns it into electricity through the rotation of electrical generators. Hydropower is the largest single renewable electricity source today, providing 16% of world electricity at competitive prices. It dominates the electricity mix in several countries, developed, emerging or developing. It is clear so far that the energy requirement is going to increase in the future and also that the U.S. and the rest of the world will depend on fossil fuels. These fossil fuels are non-renewable fuels with a finite lifetime. So the question is: Will we have enough supply for future energy requirements? "Reserves" represent that portion of demonstrated resources that can be recovered economically with the application of extraction technology available currently or in the foreseeable future. Reserves include only recoverable energy. “Resources” represent that portion of the energy that is known to exist or even suspected to exist irrespective of technical or economic viability. So reserves are a subset of resources. Annual consumption and available reserves of different non-renewable energy sources for the United States and the world. Natural gas (Wet) Trillion Cu. Ft.
As of December 31, 2016, total world proved recoverable reserves of coal were estimated at 948 billion short tons. Based on data from BP (British Petroleum), at the end of 2016 proved gas reserves were dominated by three countries: Iran, Russia, and Qatar, which together held nearly half the world's proven reserves. According to the US CIA The World Factbook, the US has the 5th largest reserves of natural gas. Due to constant updates about the shale gas estimates, these are difficult to say with certainty. How Long Will the Reserves Last? How long these reserves do last depends on the rate at which we consume these reserves. For example, let’s assume that we have $100,000 in the bank (reserves) and it we draw 10,000 dollars every year (consumption) the reserve will last for 10 years (\$100,000/\$10,000 per year). However, in this case, we are assuming that we do not add any money to our deposit and we do not increase our withdrawal. This is generally not true in the case of life of an energy reserve. We may find new reserves and our energy consumption or production can also increase. In the case of energy reserve, although we know that we might find new resources, we do not know how much we could find. But the consumption can be predicted with some accuracy based on the past rates. We can calculate the life of current petroleum reserves by dividing the current reserves by current consumption. At the current rate of consumption, the current U. S. petroleum, natural gas, and coal reserves will last approximately for 4.88 years, 12.2 years, and 258 years, respectively. It is important to note that the entire U.S. petroleum consumption is not coming from the U.S. reserves because we import more than one half of the consumption. Because we import more than one half of the consumption, the petroleum reserves at the current rate will last about 11 years. If the consumption increases in the future, the life will be less. However, there is also a chance of adding more reserves with more exploration and discoveries. The increase in consumption can change depending on the price of petroleum and other alternative fuels. Therefore, these lifetimes are not carved in stone. It can be debated whether the U.S. reserves will last for 6 years or 10 years or even 20 years, but there is increasing consensus that we must change our lifestyle. The R/P ratio can change from year to year similar to our bank balance. We can add more if we make more or consume more. That changes the time we can draw on the balance. The following figures illustrate that these ratios changed. Therefore, we must conserve, innovate (get more with less), or learn to live without these resources. Watch the following 3:12 Review for Lesson 2. Click here to open a transcript of the Lesson 2 Review video. Let's see the review for Lesson 2. In Lesson 2, we talked about energy intensity. You need to know what energy intensity is. And you need to also know about these quadrillion BTUs. Quadrillion BTUs is 10 raised to 15 BTUs. Trillion is 12, and quadrillion is 15, 10 raised to 15. And the highlights of world energy consumption and United States energy consumption are given here. You need to know about that. There was a mistake on screen 14 of the lessons, where when you put in, what is the percentage of fossil fuels? You put in 85%, and it says Wrong. But that is 85%. So just be aware of that. And you should also know how to calculate doubling time. There was an equation that I'm going to provide you. But that equation is 70 over rate of increase, gives you the doubling time. So that will be some numerical problems relating to this. And basically, it comes from the equation n equals n0 e raised to rt. OK. So you need to know how to use this equation and calculate, or project, the energy demand in future. And try to remember the differences between energy reserves and resources, and how long each of these reserves last. Approximate numbers. You don't need to remember exact numbers, but roughly, what is the lifetime for coal, oil, and natural gas, for both United States and the world. You don't have to worry about any other country. Pretty much, those are the facts that you need to know for this chapter. I don't expect you to remember exact numbers, statistics. But you need to know the top ones. Like, most of the petroleum is used for transportation. Most of the coal is used to generate electricity. You don't need to remember how much, but the majority. Or, most of the oil is used for transportation. And those kinds of details. Like which country has most of the oil deposits. Or how do we do, in terms of deposits, et cetera. Those are the basic things. And again, you don't need to remember any of the formulas or any of the conversion factors. I will provide you with those things. If you have any questions, you can always send me a question or post a question on the message board. And I will try to answer those. Why is the energy use per person in the world increasing? The United States, with 5% of the world's population, uses about 25% of the world's energy and contributes 25% of the world's greenhouse gas emissions. Explain. List the reasons why the United States per capita energy consumption is the highest of any other region in the world. List reasons why the United States energy consumption per dollar of GDP is higher than most of the industrialized nations. What is the difference between reserves and resources? List the changes that you would make in your personal lifestyle if you were mandated to reduce your energy consumption by 25%. What variables determine the lifetime of a nonrenewable resource? Hinrichs, R. A., “Energy,” Saunders College Publishers, Philadelphia, PA, 1992. Aubrecht, G. L., “Energy,” Prentice Hall, Inc., Englewood Cliffs, NJ, 1995. Fay, J.A. and Golomb, D. S., “Energy and the Environment,” Oxford University Press, New York, NY, 2002. Christensen, J. W., “Global Science: Energy Resources Environment”, 4th edition, Kendall/Hunt Publishing Company, Dubuque, IA, 1996. Energy Information Administration, Annual Energy Review, U.S. Department of Energy, 2004. Energy Information Administration, Annual Energy Outlook, DOE/EIA 0383 (2004), U.S. Department of Energy, Washington D.C., 2004. Energy Information Administration, International Energy Outlook, DOE/EIA 0484 (2004), U.S. Department of Energy, Washington D.C., 2004. The following practice exercises are designed to help you assess your readiness for the Lesson 2 quiz. Neither activity is graded and you can attempt these activities as many times as you like. You must complete a short quiz that covers the reading material in lesson 2. The Lesson 2 Quiz can be found in the Lesson 2: Energy Supply and Demand module in Canvas. Please refer to the Calendar in Canvas for specific time frames and due dates. You must complete Home Activity: Pre-Activity Check. The activity, can be found under the Home Activities  link in the Lessons menu. You have a limited window of time to access and complete the Home Activity, please refer to the Calendar in Canvas for specific time frames and due dates. Note: The Pre-Check will not be graded but it will help make sure you are prepared for the graded Home Activities.